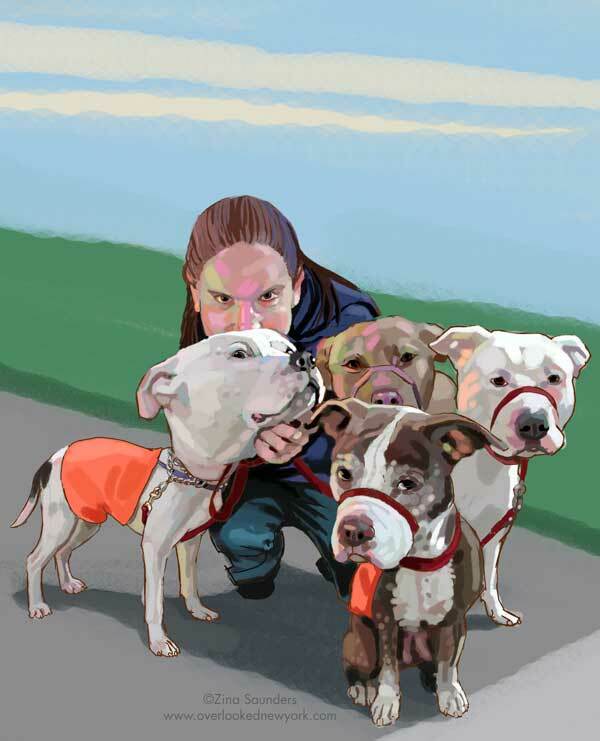 Shana, age 22, isn't a bit intimidated by pitbulls, but thinks seven of them at one time would be her limit. “I always loved animals; I had hamsters and cats and birds—but no dogs. My dad always thought you shouldn't have big dogs unless you have a house. “When I was a kid and my mom would take me to the Green Market at Union Square, Mighty Mutts would be out there, but they won't let you pet the dogs if you're under 18, and it used to make me so mad. “In the summer of my freshman year, I was in Philadelphia, and I missed New York so badly! I was still living in the dorms, and you couldn't keep pets and it was killing me. I started working on the weekends with Mighty Mutts, every Saturday sitting out with the dogs at Union Square. “I have five dogs living with me right now, two of them are mine, and the other three I'm fostering. When I drive up to stay at my parents' apartment, I bring them with me. I think seven dogs is the most I've ever had at once, and that's at the limit of how many I could have. I want to be able to give each one a lot of personal attention. “There are people who are collectors, people who have animals like 25 cats collected in their house. I don't understand them. If you can find a home as good for them, or better, I don't understand why they would keep them all.